Order verification (also known as address verification) is one of the ways that we prevent online fraud and protect you from anyone using your credit card against your knowledge. Our verification team will contact your card-issuing bank to verify that the billing name, billing address and phone number on your order are the same as what your bank has on file for you. If we need further information or if anything does not match, we will contact you by email or phone. If your order cannot be verified within 5 business days, it will automatically be canceled. All orders are subject to verification. How do I resubmit my order for verification? 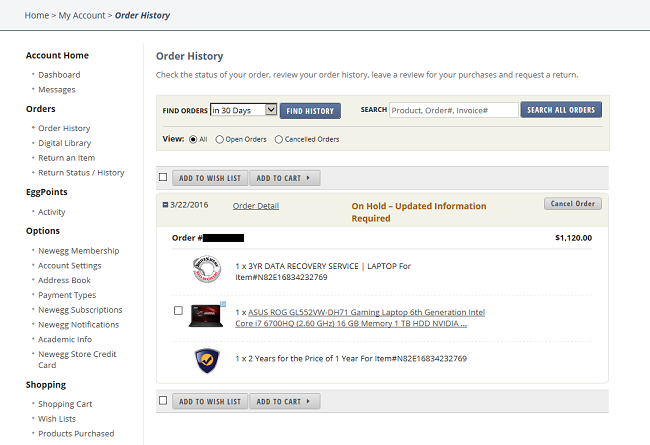 Log in to your Newegg account. 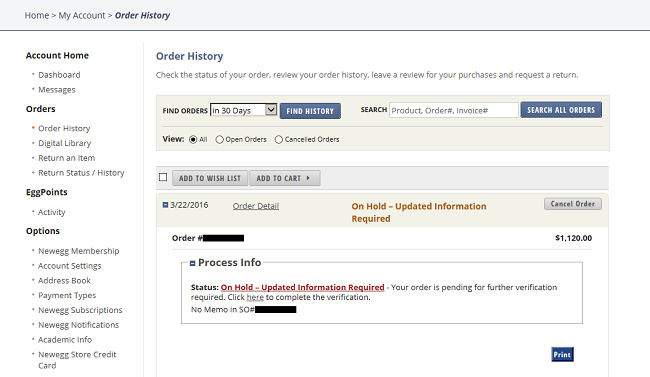 Find your order under the Recent Order Status section. Update the billing information on the order to match what you have on file with your credit card issuer. What is a phone confirmation? Phone confirmation is part of our order verification process. It requires us to speak with you directly at your billing phone number. This is only required when we need to confirm certain information for your order to be processed. Phone confirmations are done primarily to protect you and identity-theft victims from debit or credit card fraud. If you are not available, we will email you or leave a message asking you to call us back as soon as you can. If we cannot complete order verification within 5 business days after your order is placed, your order will be canceled automatically.